TubeGuard®-XL is a revolutionary additive to your chiller tube cleaning job. This formulated tablet design helps power through bio-deposits and adds a layer of corrosion protection to copper and other ferrous metal tubes.The TubeGuard-XL tablet is safe to handle, completely biodegradable and designed with environmentally friendly chemicals. It is designed for use with the RAM-PRO-XL and the RAM Chemical Dispenser, which fits most existing RAM tube cleaner models. No measuring or dosing of chemicals is required. 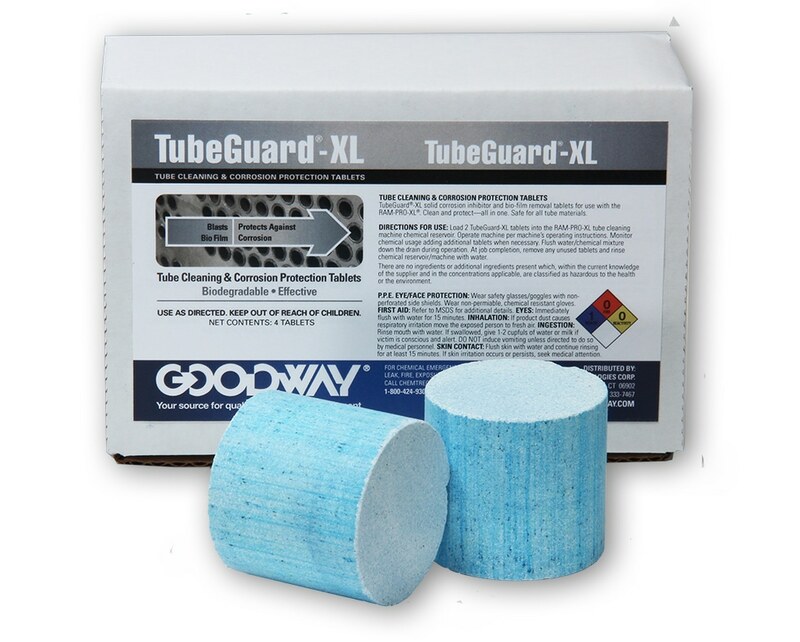 The TubeGuard-XL tablet simply dissolves in the onboard reservoir during tube cleaning; flushing the tubes in EPA certified bio-film removal compounds and corrosion inhibitors.